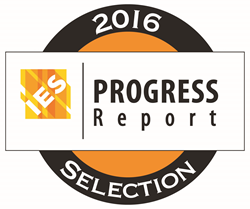 We’re very honored to have been recognized by the IES again this year. Kenall’s new SenScape™ SPG18 luminaire and Kenall Sealed Luminaires using Indigo-Clean Technology, including Millenium Stretch™ MLHA5/8/12, SimpleSeal™ HASEDI, MedMaster™ MPCADE24, MedMaster™ ME14/22/24 and MedMaster™ AMB22/24, have been named to the 2017 Illumination Engineering Society(IES) Progress Report. The IES Progress Committee must "keep in touch with developments in the art and science of lighting throughout the world, and prepare a yearly review of achievements for the Illuminating Engineering Society." These products are new to the market in 2017. SenScape SPG18 is a low-profile, high-output, sealed fixture for parking garages, canopies and low bay applications. The IP65-rated 30-, 45-, 70- and 90-watt nominal luminaires perform at high efficacies, while providing standard 10% uplight, without the need for an additional light engine. Optional controls include an embedded occupancy sensor and a daylight-harvesting sensor, both situated behind a vandal-resistant lens in order to protect the luminaire from accidental damage or intentional vandalism. Finally, a unique, integrated heat sink provides stable, efficient thermal performance, to ensure a long LED lifetime (L70). “We’re really excited about SenScape. It is a sleek, high efficiency product that works in a variety of applications. Even though it was inspired by specifiers looking for a low-profile parking garage luminaire, early market feedback tells us SenScape will also look and perform well in canopy, commercial, and low bay applications,” said Joe Welch, Kenall’s Parking and Controls Product Manager. Kenall Manufacturing was founded in Chicago, Illinois in 1963 and has built a reputation for durable lighting solutions of superior quality and exceptional value. Today, the ISO 9001-certified company focuses on the transportation, high-abuse, correctional, healthcare, sealed enclosure and food processing markets. Kenall luminaires are designed and manufactured in the USA and meet the guidelines established under the Buy American Act and the North American Free Trade Agreement. For additional information, visit http://www.kenall.com.